I can’t believe it is already week two of the One Room Challenge! Did you see all the beautiful plans linked up last week? I love that so many people are doing nurseries. I cannot wait to see how they all turn out! Check out all of the posts here! We worked hard on our room this week and I was happy with how much we got done. The room is now painted in Sherwin Williams Repose Gray. It doesn’t look drastically different than what we had before, but the tone is much grayer now and not so much blue. I love Repose gray because it doesn’t really have any of the undertones that other grays can have. It really reads as a true gray. My Dad and I are a great room painting duo. We were able to paint this room in about an hour and a half. Part of the reason we get done so quickly is that we don’t tape or do any before prep work. I haven’t taped up a wall in years before painting and it is because I have a secret weapon, this ShortCut Paint Brush. I cannot recommend this brush enough. It bends in your hand perfectly and trims out wood work and moldings so easily. If you do a lot of room painting, you absolutely need this brush. I won’t paint a room without it! We made progress in the closet as well. The drywall in here is in terrible shape. Once I started painted I realized that we maybe should have ripped it down and started over, but seriously, who wants to do that? Have you ever drywalled before? It is seriously one of the worst jobs there are. The closet got a coat of Sherwin Williams Dishy Coral. I used this same color in my closet and love how bright and cheerful it is. Since we aren’t putting a closet door back on, I want to make sure that the closet looks nice and not like a pit of bad drywall. We got working on the shelves too. These are really simple. You need 1×2 to use as support strips under the shelves cut to whatever dimensions you need. Then, using some liquid nails and regular nails, you secure it to the wall, checking for level. Then cut the shelf pieces to whatever size you want, and secure them to the support strips. I will do a more detailed tutorial on these later! I climbed in the closet for this picture so it isn’t the best image! I need to touch up the gray paint around the shelves as well! I love that the “dead” space in the corner of the closet now has a function. I hate hanging clothes back in the corner because if the outfit isn’t right in front of me, I will probably never pick it. I plan to fill these shelves with extra baby items and have purchased some cute baskets to sit on them. If this system works out, I would love to add similar shelves in my older daughter’s closet. The ceiling fan is up as well. As I mentioned in my first post, I know that not everyone loves these, but in our big ol’ AC less house, ceiling fans are necessary. I have also read that air movement helps prevent SIDS. We went with a basic white ceiling fan and Ryan installed it in less than a hour. The radiator also has a fresh coat of paint and is awaiting me to figure out what I want to put on top of it. Our last house had beautiful radiator covers that I wish we would have brought with us! I received my samples from Polka Dot Wall Stickers and am deciding which ones I want to use and where they will go! I think they are going to add a fun touch to the room! We ordered our rocker and am so excited for it to arrive! We used a more traditional rocking chair last time, but I wanted something completely upholstered this time around. I will share it when it arrives! And I really need to make a decision on our crib. I love both of these and don’t know which one to pick! Our furniture is older in the room so I am really wanting to go for a more traditional look! Do you think the gray is too light for our wall color? And because we don’t have enough going on, we painted my daughter’s room this weekend too! She is having some jealousy issues with the baby’s room getting so much attention and has been begging me to paint her room too. I resisted because I loved the bright teal in her room, but she of course, insisted on pink, as do most four year olds. The color is Sherwin Williams Charming Pink. Make sure to check out the other guest participants and what they are up to this week in the One Room Challenge! Great progress so far! Now It’s like a blank slate you can do anything with! I am also doing our nursery in mint and coral. It will be interesting to see our different decorating styles! Good luck! Thank you! Yes, I love that it is a blank slate now and we can really start decorating and putting it together! I can’t wait to see yours come together as well! I would choose the Jenny Lind Crib, I’ve always loved the way they look! Gorgeous detail and timeless. I just bought a turquoise Jenny Lind headboard from Target but the color was not quite right so I spray painted it aqua for my little girl’s ORC bedroom makeover and it looks sooo cute now! Thank you so much for weighing in…I am horrible at decisions so I am hoping you guys can sway me one way or another! I bet your headboard is adorable! I have never seen the Jenny Lind Headboard! Thank you! I hope it helps keep things better organized! Lol, if I know little girls, I bet she will still love it! It seems they all love pink for at least a few years of their lives!! I love the gray you chose for the room color, and those colorful polka dots are gonna add a lot to the room. Great progress! It is looking great! We have Repose Gray on the walls of our master and it is beautiful! And I completely agree that ceiling fans are a necessity in a baby’s room. The white is unobtrusive I think. I think repose gray is going to become my new go to color! I am glad someone agrees with me on the fans…I know so many people dislike them! Looks great! My ORC is also getting a coat of Repose Gray and I’m excited to finally see it on the wall! Love the coral accents inside the closet. I love the repose gray!! Can’t wait to see how it looks in your room too! I love it! I totally did my little girls shared room in coral and teal and love the combination-it’s going to look so great! (At first they were bummed I didn’t do the entire room floor-to-ceiling in pink, but they quickly got over it) 🙂 Love seeing all of the other ORC projects going on! Oh my… I am completely in love with the Jenny Lind crib and in that colour! I ALMOST splurged on it for our nursery, but the price of it here in Canada is astronomical and I couldn’t justify it. But DO go for it – so beautiful!!! It would have looked so cute in your nursery design! So many fun colors too!! I think I am leaning towards it!! You’ve made tons of progress already! I immediately got heart eyes when I saw that teal crib. SO SO cute! Can’t wait to see which one you choose! It’s going to be so adorable! 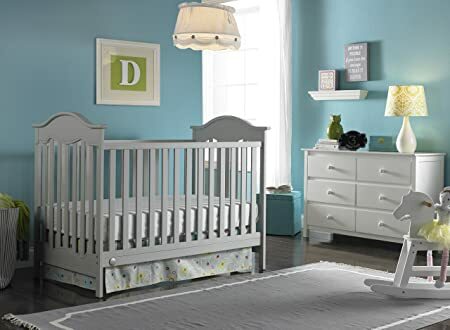 I love the paint colors together, and as far as either of those cribs, I think they are both great! Can’t wait to see next week’s progress update! This really opens the room up, thanks for sharing. New or old, there’s so much that can go with a house. You are right about the Repose gray–it looks great in your room! And I love the pops of coral! I say go for the lagoon crib! Those cute wall decals will pull everything together–can’t wait to see!!! Thank you! I think I am leaning towards the lagoon! I think it will make a big statement!! I love the color in the closet, and the grey walls are so pretty. I’d go for the Jenny Lind crib – so cute! I love your inspiration print too – can’t wait to see how all this comes together – you’ve made great progress so far! Thank you! I can’t wait to see how the polka dots turn out!! I love the colors you’ve picked, Amanda. I never thought to paint the inside of the closet in an accent color. It looks so cool in your nursery. I’m excited to see how the rest of this room turns out. I painted my closet in the same color last year and I love the burst of color it gives when I open it! Thank you for stopping by! LOVE LOVE the mix of colors! I am so eager to see what you have planned for week 3! Your color combination is truly beautiful. Thank you Stephanie! I am hoping that the colors end up coming together as I hope they will! I had no idea that air flow can help with SIDs, I definitely plan to use our fan now. I really like both cribs, that’s a hard choice. Our crib is white and I’m hoping I have time to paint it grey, kinda like what you have pictured. Excited to see what you pick! I had a friend lose a baby to SIDS so I obsessively read about it and found that fans help…it certainly can’t hurt right? ?